In this article, Leslie Aaronson, a standout ECS teacher at Foshay, is misassigned but already procured new credentials not once, but twice! By Samuel Gilstrap, published Dec 9, 2015 on LAUSD Daily. Senior Annika Gomez speaks confidently about her team’s work to use online tools to promote domestic violence awareness. 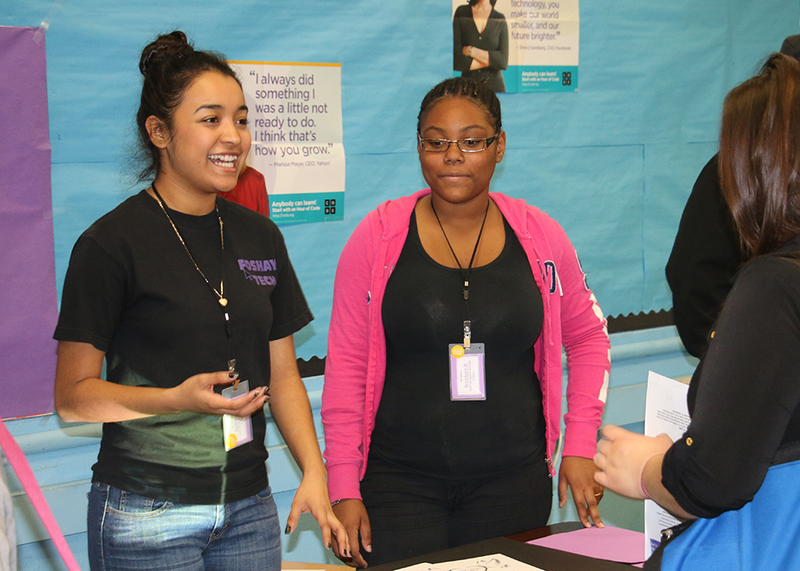 Seniors from the Technology Academy at Foshay Learning Center proudly showcased projects responding to a challenge to use technology to solve important challenges facing their community. The annual Foshay Technology Fair helped promote the District’s participation in the “Hour of Code,” a world-wide movement aimed at familiarizing students with the basics of computer science. The Hour of Code is organized by Code.org, a non-profit organization dedicated to expanding participation in computer science by making it available in more schools, and increasing participation by women and other students in groups traditionally underrepresented in technology fields. Schools across L.A. Unified are engaging their students and communities in Hour of Code activities as part of the 2015 Computer Science Education Week.